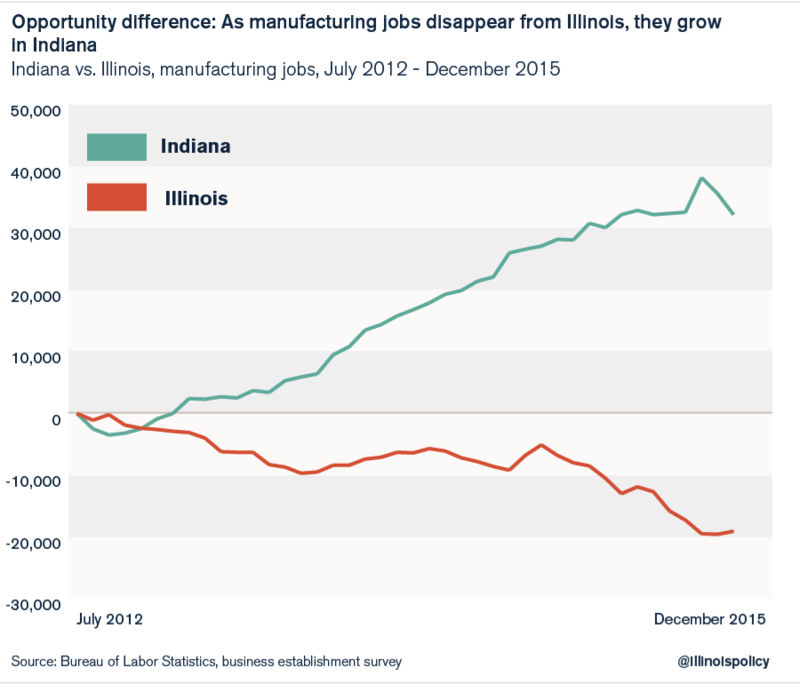 Illinois’ manufacturing meltdown and weak jobs growth are pummeling workers. Illinois employers warned of more than 1,680 layoffs in February, according to filings with the state. Many of these workers will have a difficult time getting back on their feet, given that Illinois is home to a 17-year jobs depression, the worst manufacturing climate in the region, the lowest economic confidence in the nation and the lowest wages in the Midwest for working-class families. Illinois’ longest-tenured politicians have remained silent when it comes to the state’s manufacturing woes, even as employers pack up and ship out of lawmakers’ own backyards. So what do manufacturers in the Land of Lincoln point to as job killers? The highest workers’ compensation costs in the region, the highest property taxes in the region, and a hellish lawsuit climate. As Illinoisans watch 56 manufacturing jobs disappear each workday on net, Hoosiers are benefiting from a booming manufacturing sector just across the state border – enjoying more factory jobs and higher wages. In critical industries such as manufacturing, the status quo is failing Illinoisans. And the numbers prove it. Whether it’s more job opportunities or better wages, manufacturing workers are faring better elsewhere. Real reforms are on the table, but as long as lawmakers refuse to act, expect working-class suffering to continue unabated in Illinois.